Does this sound all too familiar? Your dog is a well-mannered angel hanging around the house and back yard, and an utter charmer when running loose with his furry friends in the dog park. But when you clip a dog leash on him and he encounters another canine, look out! Your sweet best friend transforms into a snarling, aggressive beast. He barks and snaps and lunges. This is more than poor manners—this is leash aggression, and this common behavioral problem frustrates many a dog parent. Leash aggression is a problem behavior in which your dog becomes aggressive, anxious, or over-excited when encountering another dog only while attached to a lead. The issue is also commonly called leash reactivity. There are usually multiple factors at the root of leash aggression. Dogs who are anxious or overly territorial are more prone to it. Lack of proper socialization as a puppy can contribute to the unwanted behavior because your dog never learned how to say a proper “hello” to his four-legged friends. Excessive stimulation can also lead to leash reactivity because your dog is so over-excited he simply forgets any manners he learned. But many dog owners don’t allow dogs to greet this way. Instead, they pull them close and shorten the leash as the other dog approaches. This forces a face-to-face interaction, which dogs consider aggressive. This makes dogs feel vulnerable, trapped, and frustrated, and some dogs act out as a result. Then their owners pull them away or reprimand them, creating further tension, fear, and more misbehavior. 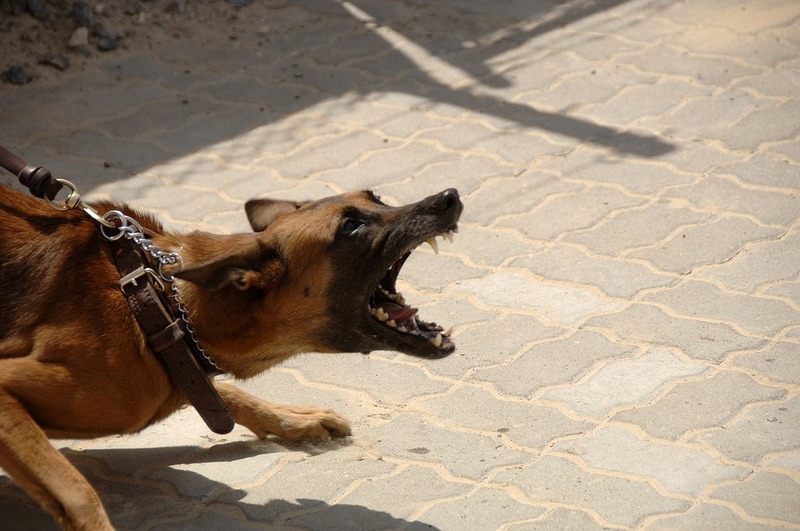 Leash aggression is often a downward cycle of frustration for both dog and dog owner. While on his leash, don’t let your puppy run up to other dogs, jump on them, push them, or get in their face. This is bad behavior and will likely be met with understandable aggression from the other dog. Give your puppy opportunities for supervised, off-leash play with other dogs in a mix of ages. Older dogs will teach your puppy his manners for you, letting him know what is acceptable behavior and what is not. The primary goal in training your dog away from leash aggression/reactivity is to develop a strong association between meeting other dogs and focusing on you. To establish this link, dog treats are your primary training tool. You need to find a treat your dog loves and reserve these special morsels as rewards for when school’s in session. Start training in an area where you’ll encounter other dogs but isn’t overrun with furry distractions. When a dog approaches, the moment your dog notices this stranger call out your dog’s name in an upbeat voice, or say “here” or another cue word. When he turns to you make eye contact and reward him with a treat. The key is catching him after he’s seen the dog but before he has a chance to react. This will require focus and attention on your part. While the other dog is in sight, keep your dog at a distance and give him treats repeatedly. When the dog is out of sight, stop doling out treats. Repeat ad infinitum. Not literally. But this is going to take awhile. Keep training sessions short, mostly because it will be tiring for you to be on high alert for long stretches. Eventually your dog will immediately turn to you when another dog enters the picture. When this starts to happen, you can slowly close the gap between him and the other dog. This process of desensitization should be slow—rushing it could undo your progres. Never punish your dog for lapses. Of course, you will contain your dog when he becomes aggressive to keep everyone safe. But pull him back firmly without yanking or yelling. And never hit your dog. Punitive responses only increase your dog’s anxiety and make him associate unpleasant responses with other dogs, thereby worsening his leash aggression. Some cases of leash aggression are so deep-seated the help of a professional dog trainer is likely required to correct the situation. If your dog’s level of reactivity is extreme—he regularly frightens people with his aggression, or he can’t settle himself down after an incident—you will probably need backup. Whether you get support or go it alone, you are your dog’s primary trainer. Whenever you go for a walk, you’ll need to be prepared and attentive. Then, incrementally, your dog’s behavior will change. Your walks with your best friend will no longer be a source of tension, but rather the pleasure they are meant to be. And that is your reward. Mary, I’m having the same issue. He totally ignores the treats and barks his head off. He’s harmless, but the other dog’s human looks terrified and pulls their dogs away while I mumble apologies. I’m scared they will think he’s aggressive and complain to my apartment folks when he just wants to say hi to their dog. He’s a saint when I take him to the dog park and he’s off the leash. Maybe someone can help us both?